Our Mission- To Bring people to a True Knowledge of God's Love for them & YOU! Our purpose here is to continue to bring people to the real and true knowledge of God's love. It's not easy to see or understand this especially when all around us there is pain, suffering and all the evils in this world. It's not until you really begin to search for the truth and start to understand things from a completely new perspective that you realise that God is really good and the cause of all our sufferings are not God but the abuse of the free will he gives us all to do what we want. Indeed God is the one who tries everything to catch our attention to guide us in a way we may not be familiar with, in the way we live and deal with each other and even the way we see ourselves and our role and purpose in this life and eternity. So although we start with prayer, because prayer is a way to communicate with God, that invites him into our lives to help us, and others. It is through prayers that we see many times that God intervenes and helps us, even miraculously. God's love is so perfect, so pure, that he is always waiting for us patiently to come to him and to ask for our needs and share our life with him. It's not that he doesn't know everything about us, or that he doesn't know us more that we even know ourselves, He does! But in prayer the reality of his love and presence in our lives is made possible, and when our prayers become a dialogue, then we really are in communion with Almighty God, who always want to guide and advise us for our own eternal safety and protection. So when you see true love around you, recognise that as coming from its rightful source, which is God. And when you see bad things and pain and suffering then also recognise that this is not from God but that He allows this because he allows people freedom and the free will to make their own decisions and choices which have consequences. So our mission here is to bring people ever more closely to the knowledge and understanding of this truth and reality. But we can only do so much, you have a role to play and a responsibility, its your choice and decision that makes all the difference. You in your turn can also help spread this Good News because this News and it is News, and the message of Salvation is for all men and women in the world. The knowledge of God's love for them. So we intent to build jesus4usall to be a community of people all working together to reach out to those who as yet may not have this knowledge of God's love for them. No matter what you offer us, your time or a donation, or even you prayers, we are grateful to you and anything you can help with will be appreciated. We cannot put a price on a soul. Even if this hard work and effort brings just one soul to the Lord Jesus and through Him they gain salvation, healing, liberation and eternal life all this will have been worth it. We aim to introduce more and more as we move forward and develop both as a web-site and community. Your help is vital for this important mission, and we can work as a body of like minded people, working and praying together, sowing and reaping a harvest together, interceding and rejoicing together as we go for the work the Lord can do through us, and for His Glory. So don't think you can't help. There is something you can do to be part of this. We want jesus4usall to really be that, bringing Jesus to all men and all countries. That's why we will aim to translate this site into as many languages as we can, because we believe that the truth is worth spreading in all the corners of the world. 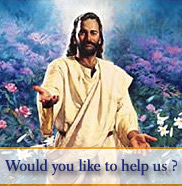 So I welcome you to jesus4usall and pray that you will be blessed by the Lord to also join us.